This is sophisticated. And I already have the other items: a dark gray blazer, white button down shirt, dark blue jeans and strands of pearls. 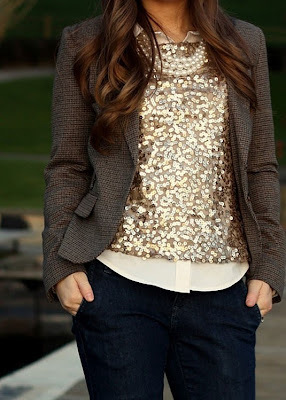 I may look around for a sequin top... I'm not sure if it will fit into budget since I recently purchased a pencil skirt online. If either works out, then I'll post about them one Sunday.